The Mitsubishi Ki-1 was a bomber built by Mitsubishi for the Imperial Japanese Army in the 1930s. The Mitsubishi Ki-1 flew for the first time in 1933. Despite its antiquated appearance, the Ki-1 was used in Manchukuo and in north China during the early stages of the Second Sino-Japanese War, in areas where danger from enemy fighter aircraft was minimal. The Mitsubishi Ki-1 was a low-wing, cantilever monoplane with fixed landing gear, twin fins and rudders, and was powered by two 701 kW (940 hp) Ha-2-2 water-cooled radial engines, giving a maximum speed of 220 km/h (140 mph). The pilot and co-pilot were seated in tandem under an enclosed canopy, while gunners sat in semi-enclosed nose and dorsal gun turrets, each armed with a single 7.7 mm (.303 in) machine gun. The usable bomb load was up to 1,500 kg (3,310 lb). The Ki-1 was based on the Junkers S36 first flown in 1927. Militarized into the Junkers K37 by Junker's Swedish subsidiary AB Flygindustri at Limhamn near Malmx�, it was able to reach altitudes not reachable for the fighters of 1927. However, as soon as 1930 this advantage was lost due to British developments such as the Bristol Bulldog fighter, and Junkers was not successful in selling the design. In 1931 however representatives of Mitsubishi Nainenki K. K. from Japan visited the Limhamn facilities to study some of the military conversions of Junkers aircraft. The sole K37 prototype S-AABP (ex D-1252 S36-prototype), as well as all development papers were purchased in part by funds raised by donations in Japan. The aircraft got the name Aikoku No.1 (patriotic gift). 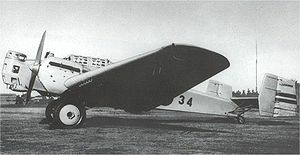 The K37 prototype was brought to Japan and tested in combat during the Manchurian Incident of 1931, following which the Imperial Japanese Army Air Force authorized Mitsubishi to produce both heavy and light bomber variations. The heavy bomber version, Ki-1, was much larger than the original Junkers K37 and first flew in August 1932. A total of 118 aircraft were built in two versions between March 1933 and April 1936. The Mitsubishi Ki-1 was initially designated Army Type 93-1 Heavy Bomber under the former aircraft nomenclature system used by the Japanese military. Already obsolete by the time of its introduction, it found use during the counterinsurgency operations of the Pacification of Manchukuo, and as well as limited use during the Second Sino-Japanese War. The design was upgraded to the Mitsubishi Ki-1-II (Army Type 93-2 Heavy Bomber) with a strengthened airframe and slightly more powerful 723 kW (970 hp) Ha-2-3 radial engines, which increased maximum speed to 230 km/h (140 mph). However, even with the new engines, the Ki-1 was still underpowered, and was unable to maintain altitude during single engine flights, which proved to be a serious issue during the aircraft's operational service due to lack of reliability of the engines. It was replaced in 1937 by the Fiat BR.20. Donald, David, ed (1997). The Encyclopedia of World Aircraft. Prospero Books. p. 652. ISBN 1-85605-375-X. Lake, Jon (2002). Great Book of Bombers. Zenith Press. p. 86. ISBN 0760313474.